RecyclerView is the most powerful, advanced and flexible version of ListView. In RecyclerView is used several different components work together to display data. Using the standard layout managers (such as LinearLayoutManager or GridLayoutManager ), you can create the list and grid both very easily. RecyclerView model is a lot of optimized and powerful. As the suggest RecyclerView is used the reusable cell when scrolling up and down. Suppose the view is displaying list positions 0 to 9 the RecyclerView has bind those view holders when user scroll down RecyclerView reuse the cell and bind with holder. One more improvement in RecyclerView is that allows us to set layout managers at runtime so we can manage scrolling such as vertical or horizontal and manage view in such as list, grid, and Staggered layout. 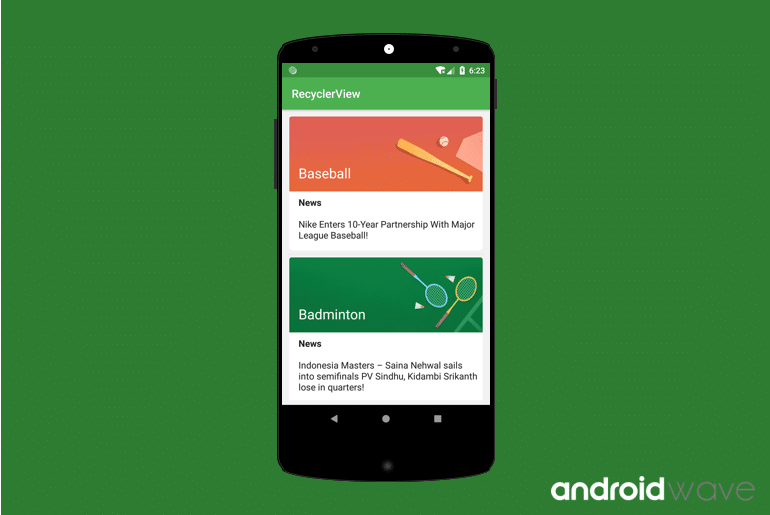 In this tutorial, We are going to explain best practices to implement RecyclerView in Android. We will create a custom layout with CardView and render it on RecyclerView. We discuss in detail about some relevant classes such as LayoutManager, ViewHolder, Adapter, ItemDecoration etc. Open string.xml add string values and demo content arrays for showing in list. Go to src and create a new Java class with BaseViewHolder which extends RecyclerView.ViewHolder , We will use BaseViewHolder class instance of RecyclerView holder class, It improves your code quality and eliminate boilerplate code. Let’s start writing a adapter class with hold the list item and render on RecyclerView in Android. Create a new POJO class, and define some entity such as title, subtitle, and news discerption with getter setter. Just go to res directory and create a xml layout for displaying a single row of RecyclerView. Which contain some ImageView, TextView along with CardView. Bind view by id using ButterKnife. Setup LinearLayoutManager and DefaultItemAnimator on RecyclerView. Prepare demo content (In your you can fetch date from the remote server using retrofit). * Draws horizontal or vertical dividers onto the parent RecyclerView.